Every Sunday at MSAC's CYMS basketball league, a mini-crowd forms to huddle around Court 7 to watch the show. They're not there to watch the retired VBL or NBL stars from Breakaway, Moonee Ponds or Westside. They're not there to cheer on their mates from Melbourne Uni. They come to see the Longhorns. To see dunks. To see showtime. 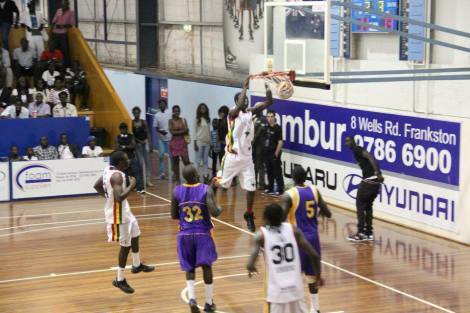 The Longhorns are a South Sudanese-Australian basketball association founded by Manyang 'Manny' Berberi. Hey Manny, thanks for doing an MUBC interview. With all the hype around Longhorn alumni Mangok 'Mango' Mathiang at the NCAA tournament this year, we'd love to learn more about your club. Where did the Longhorns name come from and how did you get started? The Longhorns name comes from the Long horned cattle our community keeps in South Sudan. These type of cows are called the Zebu cattle and are loved by the locals because they are really key to their livelihoods. The majority of people in South Sudan are farmers and they grow their crops and keep their cattle like their ancestors did for thousands of years. The Sudan and South Sudan are lands that have been rocked by civil wars over the last 60 years and that has seen massive migration of sections of their population to other lands in other parts of the world for a better life for their families. I started Longhorns Basketball Club on the 15th Feb 2003 in Sunshine. I selected a few mates and we trained at a local high school basketball facility. We then registered our team in the local Sunshine Basketball Association (now the Maribyrnong Basketball Association). What is the purpose of the Longhorns, how do you see it working best? The Longhorns basketball club's main purpose is to engage the youth in the community through basketball. We would like to involve as many young people as we can from our community and other communities as well. We have seen the importance of the sport over the years. We want to use it as much as we can to keep the youth out of the streets and out of trouble. We would also like to develop highly skilled players that can go on to play at the college and professional levels. There are young players at the club that have shown a good ability to play at the next level. The way we are going about it so it works out well is, we are starting them off at u/10s. The earlier they can start, the better. This makes them develop fundamentals at a young age. How many kids have been through the program and what support do you offer them? The number of kids that have gone through the program over the last 12 years might be over 300. We mentor them about life skills, not just basketball. They get to train with us and play in the junior teams in the local competition every Saturday. We have also made partnerships with other local community organisations offering great services like home work support. Over the last few years, it seems like there has been a more noticeable influx of Sudanese refugees coming to Melbourne. Can you give us some background on the situation and your thoughts on Australia as a new home for your people? The Sudan was the biggest country in Africa until 9th/July 2011 when it separated into two countries i.e Sudan and South Sudan. The majority of the people from my Community are from South Sudan and would like to be referred to as South Sudanese . We think what happened in the Sudan is similar to what happened to the old Yugoslavia when it divided into smaller countries due to political instability. The instability in the Sudan has been going on for about 60 years. This caused a huge migration of sections of it's population to other countries over the years. The majority of people in my community migrated to Australia in the mid 90s and early 2000s. The population of South Sudanese in Australia is said to be about 37,000. The majority of that population lives in Sydney and Melbourne. We think Australia is one of the best countries in the world. It is multicultural and people are very welcoming. You feel part of the Australian story as soon as you come to Australia because almost everyone has a migration story. If they don't, their parents did. My community is now beginning to be well settled in Australia. Almost every kid playing basketball in u/10s from my community has been born in Australia. Your Sunday CYMS team has featured some athletic superstars like Deng Deng and Deng Adel who have both been signed to bigtime college programs like Baylor and Louisville. Which Longhorns do you think have shown they have big futures in the sport? Deng Deng was one of our first breakout players that showed just ridiculous ability in the sport of basketball. He was 6'9 but could run like a gazelle, had a 40 inch vertical leap, 7'5 wingspan. He got to a JUCO at Lee college in Texas and then got a scholarship to Baylor University. We think he will play in the pros. We then had Emmanuel Malou who was another 6'9 athlete. It's ridiculous how these kids grow up so fast because I remember Emmanuel Malou coming to sign up at the club as this skinny little 12 year old that couldn't do 5 push ups. They all grew up so fast. Emmanuel Malou is now at YUBA college which is a JUCO in California. He is being recruited by big schools like Arizona, Ohio St, Gonzaga etc. He has a lot of professional ability, his natural ability is great. He has some of the biggest hands you will ever see, a huge vertical leap and shoots the ball really well for someone his size. Deng Adel is a 6'7 athlete that has signed with Louisville for next season. He is probably the most skilled player to come out of the club. His combination of size, IQ and shooting ability is very hard to find. He will definitely play at the professional level. Another younger players that is coming out of the club is 16 year old 6'9 Mayen Kiir. There is also a 15 year old 6'5 Kuany Kuany and some other other younger ones showing potential. We let them know that it's a matter of working hard. Not everyone will be going to the NBA so education is a very important part of what we emphasis on. Thon Maker is obviously very talented. The reason why there is a lot of interest in him from pretty much every big school in America is because he is 7'1 but plays almost like a guard. His skill set is very good for a guy that size. His brother is going to be very talented as well. Thon Maker has said he wants to play for Australia. There are media reports that Canada is trying to pinch them because he went to an academy in Canada recently with his brother after spending sometime at a high school in Virginia. He already said he is keen on wearing the Green and Gold. Thon arrived in Perth, Australia with his family as a 5 year old. They lived there until he was about 12 and then moved to Sydney. After playing basketball in Sydney for a few years he got an opportunity to go to America. © Melbourne University Basketball Club 2019. This page was last updated by smoke on April 14th, 2015.